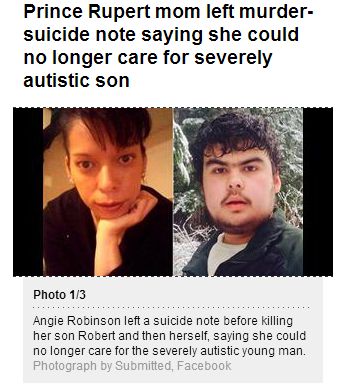 Today I read an article from The Province that I came across on facebook indicating that a mother of a severely autistic 16 year old boy from Prince Rupert, BC had committed an act of murder-suicide. As I read the article it pulled at my heart strings as I could not even imagine the place this mother must have been in to commit such an act. I will never fully understand how hard it is for parents who have children that are nonverbal. I can only remember the fears I had of an unknown future when my Monkey was not yet speaking. Click here to watch a video about the incident from Global BC. Many of us in Canada face the fact that services, in almost every province, are lacking and a lot of the burden is left entirely on the parents to find a way to fund their own private therapies or take on the role of learning all they can and doing therapy with their children on their own. Many of you (like Rebecca and I) work full time, many of you are single parents or have spouses that are rarely home, many of you have multiple children on the spectrum at varying ends of the scale yet the majority of us still manage to do the best that we can with what we have. Stories like the one above sadden and anger me because I do not see autism in such a grim and devastating light. When I read stories like these that blame a lack of services on the root cause of the decision to commit such an act I have to question what else was going on? I understand the human need to want to blame such an act on something out of ones control but a lack of services is not the only thing going on here that would contribute to her taking her sons life and her own. We can not begin to understand what life was like in their home on a daily basis but I can assume that stress, depression, hopelessness for her situation, played a major role in her decision and going at it alone would be difficult. As a parent I could never imagine losing my child let alone taking his life and then my own. Regardless of a disability their life is precious and there is always another solution. So when I read this article the first time I found myself judging her for what she had done. How could she be so selfish? If you take your own life there is usually depression at play so did she ever go see a doctor regarding her feelings of despair? What types of services did they have access to and did they use them to the fullest? Were they using schedules or PECS to try and communicate with her son? Why was there an increase in his aggression? Could there have been something else going on either at home or at school? Had there been a change in routine? Was he sick or possibly having headaches?How were the other family member’s helping? I judged her negatively for something I can never begin to understand as I have not walked in her shoes.Then I stepped back. We do not know what life was like in their home or what services had been received. Their journey was their own and we will never know what were the circumstances that led to such a decision. We only see what is shown to us by the media. In the end this poor women felt that this was the only way that she could help her son and herself. Life in the spectrum can be very lonely and so I can not judge her for the decision she has made but merely feel sorry that such a thing had to occur and that two lives were cut short. A lack of services, when trying to find long term care for her son, may have been the final straw that pushed her over the edge of what she felt that she could humanly tolerate but in the end it still does not justify the final act. During a month where we try to bring awareness to autism it is a sad note that this is what is in the forefront of the news. To often it is the devastation that autism sometimes brings that is brought to everyone’s attention. Rarely does the beauty and uniqueness of autism ever get highlighted by national news reports. This is a sin in my eyes as the public then only associates autism with children who run away, who can not speak, who are a burden to their loved ones when this is furthest from the truth. Although this incident will draw the attention towards the lack of services needed for our children through all stages of their lives it isn’t the happiest way to end Autism Awareness month. To any of you that are feeling lost, alone, and like you can not do it anymore please find someone you can speak with. There is always a way out of any situation, suicide is never the answer. ← Let’s Go To The Movies!